A less-than-super volcano. Credit: Oliver Spalt. Previous post in this series: In Space, No One Can Hear You Scream. 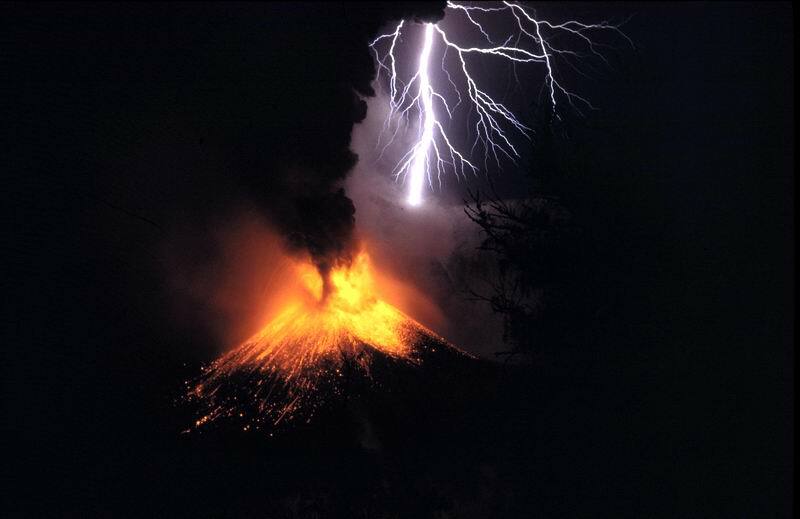 Q: If global warming puts us in danger through temperature rise, and super-volcanos put us into danger of global cooling, shouldn’t those two dangers balance each other out? Randall’s response: Two people are walking through a snowstorm. Woman: If we stay out here much longer, we’ll get frostbite! Man: A fever would cancel that out, right? Good thing I didn’t get my flu shot. My response: No. A supervolcano is much worse, and might not even cause long-term cooling. A supervolcano is a volcano capable of erupting 1,000 cubic kilometers of magma at once. This is a thousand time the size of what are conventionally thought of as disastrous eruptions like Mount St. Helens in 1980 and Mount Vesuvius in AD 79. The best known supervolcano is probably the one in Yellowstone National Park. Second, a supervolcano would throw a lot of dust and ash and sun-blocking chemicals like sulfur dioxide into the atmosphere, which would cause the Earth to cool down. But this isn’t the kind of cooling down that would balance out global warming. The eruption of Mount Tambora in 1815 was the largest in modern times. It was a tenth the size of a supervolcano eruption, and it caused the Year Without a Summer. We don’t really know what a supervolcano would do to the climate. One theory states that the eruption of Lake Toba 74,000 years ago caused a volcanic winter (like a nuclear winter without the fallout) that lasted several years and wiped out most of the human population. However, other theories dispute this. So a supervolcano might not change the climate enough to beat a bad bout of global warming, it might cause a devastating winter that is nonetheless over in a decade, or it might trigger a new ice age. In any case, it’s highly unlike to perfectly balance global warming (and we don’t really know how much of that we’re going to get either). Oh, and all of this assumes that a supervolcano will actually erupt. Supervolcanoes only erupt about once every 100,000 years, so the odds of it happening in this century are, thankfully, slim. This entry was posted in Geology, Science, What If? Rejects and tagged balancing act, global warming, supervolcano, yellowstone. Bookmark the permalink. Never heard about the Year W/o A Summer. Fascinating.